Been able to have full control over your JVZoo sales across the board, including data on all previous sales and refunds (which is not possible with any other service, right now) is a complete game changer. Recently, our neighbours’ cat was seen walking in the middle of the county road in front of my house, with a can over her head. Evidently, she got into the recycle box and decided a nice meal was waiting for her inside the bottom of the can. Unfortunately, she miscalculated her way out of the buffet. She stopped two cars as she meandered blindly down the road, then ran to safety into a yard when a driver tried to reach her and remove the can. This is how it is for affiliates and product creators at times. We want to know what is going on with our sales, but we move blindly because we do not know anything about our affiliate data. Who bought, who sold, how much, how many? Well, now there is clarity. Kevin Fahely has just produced a plugin that will help with these blind spots and many others. Have access to all your data in an easy to search database including affiliate sales. View a streamline of your sellers sales with the product name, affiliate, customer, etc. IM Funnels – 16 Done For You Affiliate Marketing funnels! At only $19.95 the price for this plugin is well worth the cost to revolutionize your knowledge of your own business. 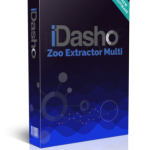 Kudos to Kevin Fahely for his insight and understanding of the need for iDasho, an affiliate data filing system for JVZoo, and his professional development to make it happen. Connect an unlimited number of JVZoo accounts. OTO #3 – iDasho Reseller Partner, (own the brand, 100% reseller) 97.00 / Lite – Sell iDasho funnel and earn 100% commission. Reseller lite is 100% commission on the front end only, $47.00. *I just saw the kitty next door. Snowball is fine.